(CNN) -- Federal regulators have cleared the way for the first human trials of human embryonic stem-cell research, authorizing researchers to test whether the cells are safe to use in spinal injury patients, the company behind the trials announced Friday. Embryonic stem cells are blank cells found in embryos, which have the ability to turn into any cell in the body. 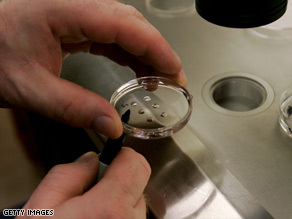 The first human embryonic stem cells were developed by Jamie Thomson at the University of Wisconsin-Madison in 1998.